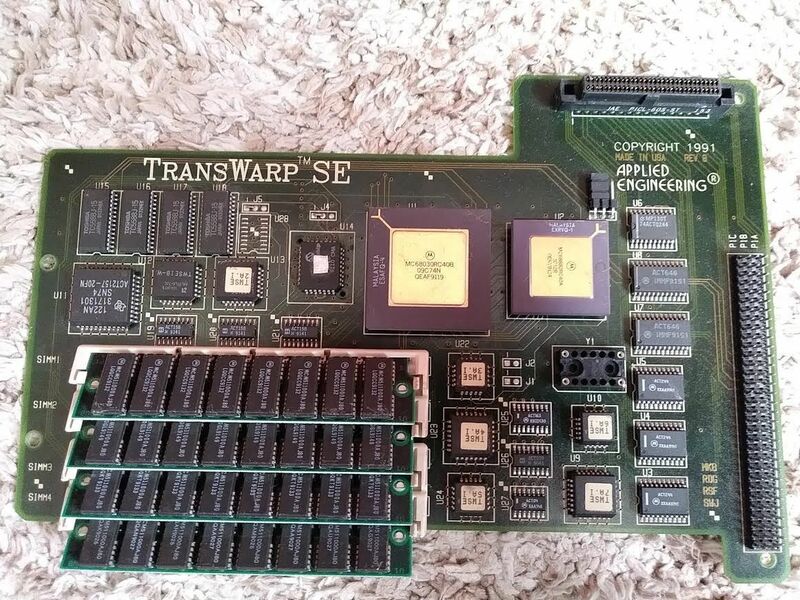 1991 Applied Engineering Transwarp SE missing oscillator? Purchased a 1991 AE TW made for the Mac SE. The Mac SE boots fine and is otherwise stock hardware. After I installed the TW card, the SE just displayes a few random black and white squares on the screen - no startup chime. It's not a checkerboard pattern. Swapped out the Transwarp's CPU & Math co-processor with ones with the same specs, same issue. Re-seated the TW's RAM and tested the modules in the SE. Also tried booting with no RAM installed on the SE motherboard. I noticed there's an empty socket labeled "Y1" on the TW card that might be for an oscillator - but can't find pictures confirming that there should be an oscillator installed in this socket. Never seen a card without one except this AE TW. Please see the picture. Can anyone confirm that there should be an oscillator installed at "Y1". Otherwise, I may just have a dead accelerator. I can't imagine how that would work without the oscillator in there. No, I think it is pretty obscure. Unless someone out there happens to have one. Any idea what frequency oscillator you might need? I doubt it would hurt to try dropping one in there, provided you don't greatly exceed the value that it needs. I just wouldn't know whether you need 1x the clock of the CPU or 2x. Those would be the typical. It would probably be safe to put in 1x because it might work, just at 1/2 the intended speed. Putting one 2x in that needs 1x could fry something. But all this is just guessing, because I'm really more of an Apple II guy than a Mac guy to begin with. Looking at the picture again, I might be inclined to try a 40MHz oscillator in there. If it is intended to have a 2x clock oscillator in there it might still run at 20MHz, which would still be over twice as fast as a stock SE. If it needs a 1X oscillator, then you'd be cranking along at full speed. I scavenged a 50 mhz oscillator from a dead Daystar P33 Mac IIci accellerator (and the CPU) and installed them in the AE TW card and it did the trick! Super fast Mac SE! Nice! That's probably a little overclocked, but if it runs stable it's all good! Any chance you want to get rid of your dead Daystar accelerator? I have another P33 - also dead. Might be able to make a working one out of the two dead ones by swapping around components. Hi Bolle - normally I would but I sort of did a number on it getting the oscillator off and there were some burnt out capacitors, so I chucked it after taking the 50mhz CPU for the TW SE card.